The phone maker has teamed up with Dutch ecommerce merchant JeansOnline to make exclusive offers to Samsung phone owners who tap a TecTiles tag or scan a QR code at a pop-up store in the city centre. 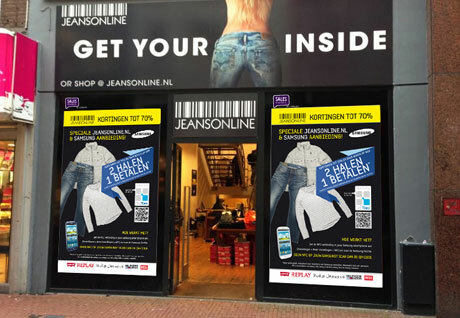 Samsung has partnered with Dutch merchant JeansOnline, the country’s largest retailer of brand name jeans, and technology provider SalesWindow to promote the use of the NFC functionality in phones including the Samsung Galaxy S III, Galaxy S III Mini and Galaxy Note II. At the retailer’s pop-up store on Amsterdam’s Kalverstraat, customers who use a Samsung NFC phone to read a TecTiles NFC sticker in the shop window, or scan a QR code with their camera phone, will receive a coupon entitling them to receive a second item with every purchase, free of charge. Customers who scan a TecTiles NFC tag in the store and post an image of their purchase on Facebook are also eligible for a chance to win a €100 voucher. “The goal is to let everyone know the useful features of the NFC functionality in Samsung smartphones,” the phone maker says.